Each coin is composed of 99.99% pure silver. Maximum mintage of the release is limited to just 225,000. Shown on the reverse of the strike is a design by Canadian artist Emily Damstra. 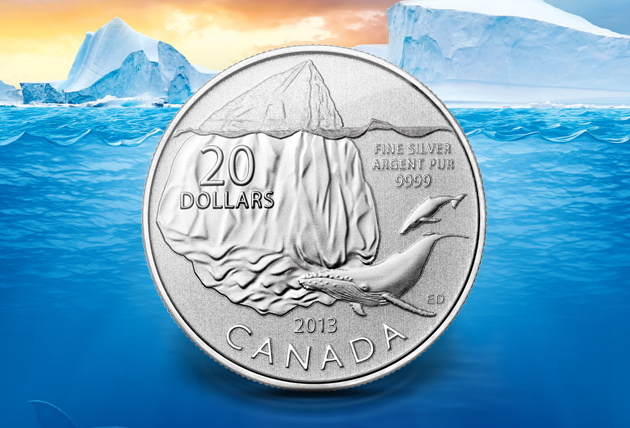 "Witness the awesome beauty of a majestic iceberg, slowly melting into the sunset over the warming summer months," offers the Royal Canadian Mint. "Feared by mariners for centuries, this place, where the cold Labrador Current merges with the warm Gulf Stream, is known to many as "Iceberg Alley." The reverse design shows a massive iceberg floating in the water. Two whales are also shown in the design. 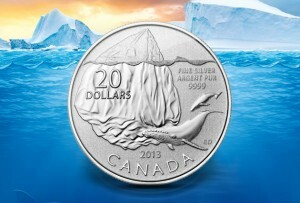 Inscriptions include CANADA, 2013, 20 DOLLARS, FINE SILVER ARGENT PUR 9999. On the obverse, Susanna Blunt's effigy of Queen Elizabeth II appears. Inscriptions around the portrait are ELIZABETH II and D G REGINA. All previous release of the program have sold out. As stated, mintage of the newest strike is limited to only 225,000. This is 25,000 less than issued for previous coins of the program.